One of the leading retail banks in Nigeria, Skye Bank, has again showed why it is gradually winning the hearts of Nigerians. The lender, which boasts of wide-ranging electronic solutions promoting consumer lifestyle and e-commerce experience for its customers, has again produced another millionaire in this period some Nigerians describe as “tough”. 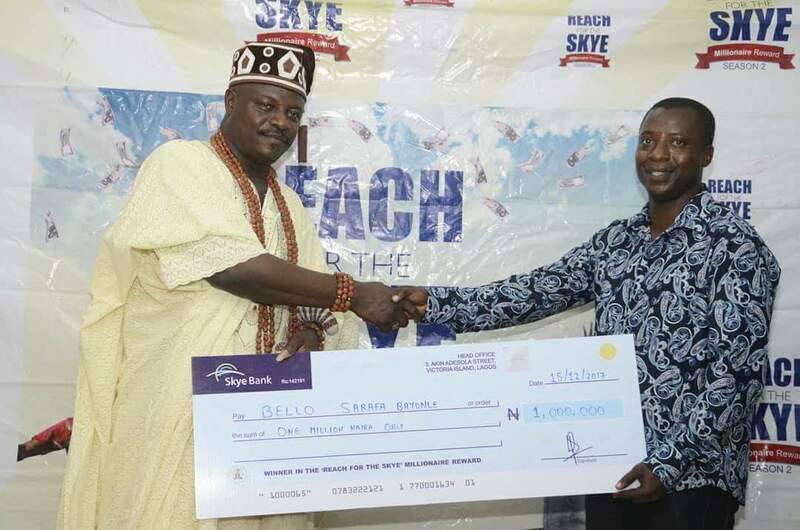 The financial institution, led by prolific banker, Mr Tokunbo Abiru, a couple of days ago, produced another millionaire in Port Harcourt, Rivers State, through its ‘Reach for the Skye Millionaire’ reward promo. The ‘Reach for the Skye Millionaire’ reward promo was put in place by the management of the bank to increase the flow of funds to support SMEs, accelerate employment generation and development of indigenous entrepreneurship as well as encourage saving culture among Nigerians. The reward promo, which has seen several customers of Skye Bank winning N1 million and other consolation prizes, recently moved to Mile 3 Market Park, Port Harcourt, Rivers State with another millionaire emerging through a transparent electronic draw under the watchful eyes of the officials of Consumer Protection Council (CPC) and National Lottery Regulatory Commission (NLRC). Apart from the grand prize of winning N1 million, several other customers also won various cash prizes including N100,000 for 10 customers, N50,000 for another 10 customers and N20,000 for 20 loyal customers and these mouth watery prizes exists every month throughout the period of the scheme. Gift items such as table top fridge, generator, table top gas cookers, mobile phones, blenders and recharge cards are also available to be won. Since its introduction, the Skye Bank ‘Reach for the Skye Millionaire’ reward promo has been changing the lives of many for the better. The initiative, which is open to all individual savings account holders in the bank, has produced previous millionaires including Olusola Olusegun Ezekiel of Ikorodu branch in Lagos; Elizabeth Ohaeme of Mgbidi branch in Owerri and Buhari Aminu of Ibrahim Taiwo branch in Kano and other consolation prizes, meant to encourage savings culture amongst the retail market segment. Speaking on the bank’s commitment, Group Head, Product & Innovation, Skye Bank Plc, Ndubuisi Osakwe, said, “The reward initiative provides a unique opportunity for the bank to stay in touch and reward its savings customers, who have unique roles to play in the country’s economic expansion”. Part of activities lined up for the event is the instant reward for people who open any savings account during the draw as well as the electronic draw for cash prize winners. The instant reward items at the draw venue include: generator sets, refrigerators, blenders, phones, table gas cookers and even recharge cards.